Edwin Diaz put an end to the Giants' hopes of a comeback win and notched his third save of the season for Seattle. SAN FRANCISCO — Coming into the 2018 season, it was apparent that the Mariners’ offense was going to score runs in most games. Given the versatility and depth of the projected lineup, scoring runs wouldn’t, or at least shouldn’t, be an issue, even with Nelson Cruz and Mike Zunino noticeably absent for the next week. The Mariners banged out 12 hits, scored four runs in the first inning before making an out and providing more than enough run support for starter Marco Gonzales, who delivered an encouraging outing, in a 6-4 win over the Giants. Seattle didn’t hit a homer, but had runners on base in seven of the nine innings with seven of the eight position players notching hits. While the Mariners’ offense was expected to produce, Gonzales, despite the positive outlook from Servais and general manger Jerry Dipoto since being acquired, was still an unknown commodity coming into this season. They all believed that Gonzales, now in his second year removed from Tommy John surgery, would be better in 2018. A solid spring training from Gonzales only added to the optimism. It carried over into his first start of the season. Gonzales pitched a career-high 6 1/3 innings, allowing three runs on six hits with no walks and two strikeouts. It was a solid first start for a rotation that is going to depend on the young lefty. For Gonzales, the only bad aspect of the outing was how it ended — prematurely on a two-run homer from Evan Longoria. With Seattle up 6-1, Gonzales struck out Andrew McCutchen on a nasty changeup for the first out. “Honestly the pitch to Longoria was the only pitch I threw today that didn’t have conviction behind it,” he said. Edwin Diaz would have no such drama in the bottom of the ninth. The Mariners’ closer came in and struck out Longoria and Hunter Pence and then got Nick Hundley to pop out weakly for his third save of the season. On a gorgeous, sun-drenched day at AT&T Park where the Giants rolled out all pomp and circumstance fitting a home opener, including a pregame ceremony that featured Willie Mays, Willie McCovey, Barry Bonds and Dusty Baker, the Mariners played spoiler, quieting the sold-out crowd of 40,901 immediately. They jumped all over Giants starter Ty Blach in the first inning. Back-to-back singles by Dee Gordon and Jean Segura and a walk from Robinson Cano loaded the bases. Given a nice little lead, Gonzales cruised through the first four innings, allowing just one hit against a Giants offense that had scored just two runs in the previous four games on a pair of solo homers from second baseman Joe Panik. The Giants’ first run of the game and third of the season was also provided by a Panik homer — a solo blast into McCovey Cove in the fourth inning to make it 4-1. According to Elias Sports Bureau, the Giants are the first team in MLB history whose first three runs of a season came on solo home runs by the same player. 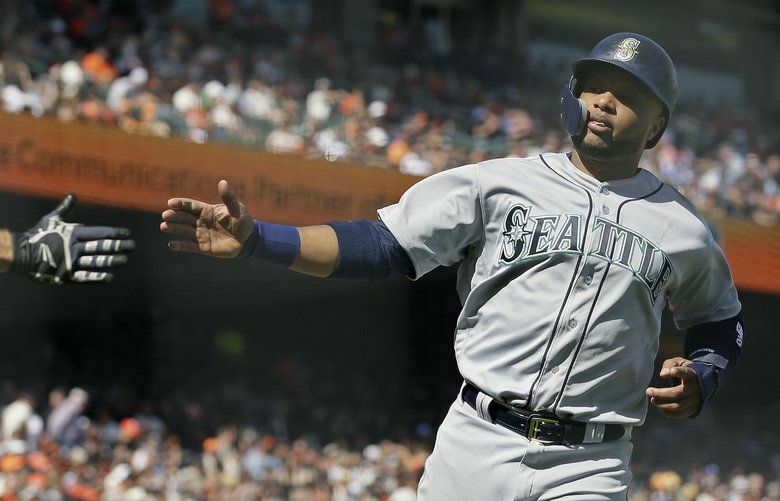 Seattle scored two runs in the fifth on an RBI double from Robinson Cano and sacrifice fly from Guillermo Heredia. Gordon finished the day 3 for 5 with two stolen bases, while Segura reached base four times with two singles, a double and a walk with two runs scored.